Henry VIII’s wives bicker and banter in this heady, hilarious fantasia. “She had all the royal makings of a queen,” a gentleman says of Anne Boleyn in Shakespeare’s Henry VIII. Alas, Henry was a perfectionist, and five other wives fit the very same description. 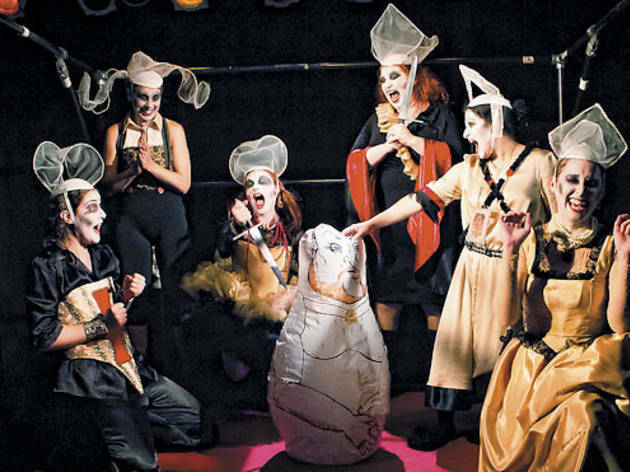 Six Dead Queens and an Inflatable Henry! brings together the whole doomed sextet on a single bed—you might call it empire-sized—for a riotous hour-plus of score-settling, frank testifying and rank catfighting. Also, harmonizing. The queens are the house band as well, revving up clever, era-bending tunes that transcend the sometimes wordy exposition. Eternal togetherness makes for lengthy jousts about whose heir-focused life was ghastliest and whom the king liked best. As brainy Catherine Parr, Denita Linnertz brings a classical grace and fierce wit to a complex part; the unlucky German, Anne of Cleves, has a worthy representative in Deborah Craft Proud, who’s a compact, intense presence. This is the Chicago debut of Evanston’s Piccolo Theatre, which took up the 1999 play from the now-defunct Foursight Theatre of England. There’s a deadly serious message here about the fate of women in societies that reduce them to their wombs, but the cumulative creators have a light touch with the chopping block.